Calling all students with vision and ambition! The National Junior Honor Society (NJHS) can help you make your life’s dreams real. Strive to be a member to make an impact, not just for yourself, but for your community and for the world. Watch and learn why you’ll want to strive to be a member of NJHS! For starters, you’ll need strong grades. Once you have verified that your school has an active chapter, you must be in grades 6–9. (Students must be in their second semester of sixth grade for consideration. Ninth grade students are only eligible for inclusion in NJHS if they attend a middle level school. Ninth grade students in a traditional 9-12 high school are not eligible for NJHS membership.) You must also meet the school’s eligibility requirements to be invited to join. 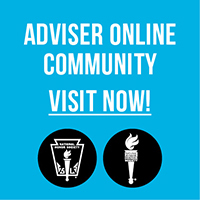 Check with your school’s main office to identify your chapter adviser. The adviser can then explain the process.